No matter the time of the year, Christmas lights make for ideal dorm decorations. They’re fun, they’re colorful, and they light up! What more could you ask for in your college decorations? Since they’re also cheap dorm items, you can buy a few sets and really let your dorm decorating ideas run wild. First and foremost, lights for dorms make for some of the best dorm wall decorations you’ll find! Light strings automatically capture anyone’s attention, and you can decorate and design in all sorts of patterns and layouts. Feel free to think outside of the box and even run some Christmas lights across your ceiling or use them to outline your window frame. The choice is yours! DormCo’s Christmas lights feature incandescent bulbs, meaning they’ll be bright and plenty colorful. Our incandescent lights burn for up to 3,000 hours, so you’ll have plenty of time to enjoy their glow. Check out DormCo’s array of mini lights for dorms, as they’re small, cheap dorm items that won’t take up much space but will really add to your college lighting and will take your dorm décor up a notch. Mini lights for dorms are also versatile decorations for dorm rooms. You can choose your school colors or you can opt for your favorite colors! If you have a couple sets, they can also create alternative, dimmer lighting to use as a nightlight or to create lower lighting when watching a movie or just relaxing. 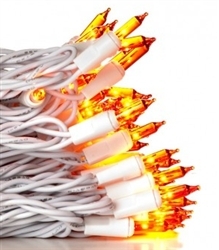 If you want some slightly larger and brighter bulbs, choose our C7-sized Christmas lights. For these college lights, you can get a socket cord and then choose from a variety of styles and colors for the bulbs. The bulbs themselves screw into the cord, meaning you can easily mix and match colors to create all sorts of lighting arrangements. When selecting C7 bulbs, you can choose from standard transparent bulbs, or you can give your dorm room a retro look by adding opaque bulbs. DormCo also has twinkle bulbs, which will twinkle on and off to create some truly captivating and eye-catching college wall decorations. Just as with the mini lights, these C7 lights create some truly standout wall decorations for dorms. College decorations should offer some more room for creativity and fun after all, and Christmas lights for college dorms will do just that. They’re cool dorm items for any student’s inventory of college products!